Y-12 Prisoners on the move! here is an update on our friends. sometime this [Tuesday] morning, steve baggarly, beth rosdatter and bonnie urfer were whisked out of tennessee to points unknown. we discovered just after noon that they were gone. no idea how long they will be there. but here is the contact info if you are inclined to write. so far as we know, as of this afternoon, mike walli and dennis duvall are still in blount county jail. 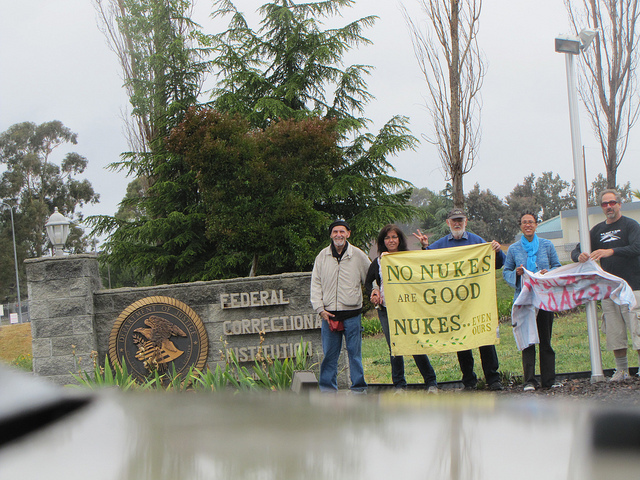 Editor’s Note: We keep all the Y-12 prisoners of conscience addresses regularly updated at the Nuclear Abolitionist Y-12 Witness Page. tottering toward the park, avoiding people who had sunk to the ground. held out, with their skin peeled and hung down like potato skins. fallen out. Everyone there agreed that if he drank water he would die. under the tree for a while. And we proceeded with our conversation. the explosive power of that first bomb, and there are more in reserve. conspire daily in preparation and rehearsal for the end of the world. United States must make good on international commitments to disarm. relentlessness, we must lead the world in a nuclear DIS-armament race. Lynne Greenwald Free! Join us in celebration (of FREEDOM)! have her ankle bracelet removed– free at last. house during the last few weeks – free at last. freedom in all its manifestations. We will provide a large pot of stew as well as delectable desserts. is the food that Lynne most missed. released from correctional facilities in Washington state. Lynne Greenwald is OUT of prison! She has done her time, and to quote lynne, “I’m home and all is good!” She got out yesterday, and went directly to the Federal Building in Tacoma where she met with the folks in the Probation Department. I understand that while there she met fellow ex-con and fellow Disarm Now Plowshares resister Sr. Anne Montgomery who was there with attorney Blake Kremer; a most pleasant surprise indeed (a small, small world). Susan and Steve still have a long way to go until they walk out of prison. Each got 15 months, and won’t be out until roughly the end of June 2012. Check out the Contact page for their current mailing addresses and drop them a line. I bow to the sacred in each person in this room and to my sisters and brothers around the world. I bow to the sacred in all plants and animals. I bow to the sacred in all the gifts of creation found on planet Earth and in our Universe. In order to protect all the sacred gifts of creation, I feel called to do whatever is necessary to abolish nuclear weapons. My years of nonviolent resistance and acts of conscience have their roots in my Christian baptismal promise to renounce and resist evil, and in the public witness of my religious vows as a Catholic sister. It is a known fact that nuclear weapons are instruments of death and massive destruction. The explosion of a nuclear bomb gives off immense quantities of heat and energy, as well as powerful and prolonged radiation that cannot be contained in time and space. This violence of nuclear weapons has the potential to destroy all that is sacred—all living beings, as well as our ecosystems, and our planet. To my surprise a copy of this sign was not included in the Discovery Document from the government while the copies of two signs carried by other codefendants were included. With my sign and nonviolent act of conscience, it was my hope to bring a lawless situation into the court of justice. 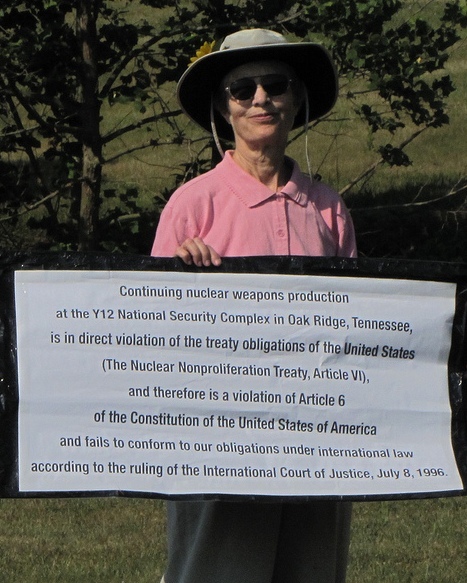 It was my hope and expectation that the judge and jury would weigh in the balance of justice the gravity of the United States violating international law and the Constitution of the United States, with my puny action of calling attention to these violations regarding the continued nuclear bomb production at Y-12. In the United States justice system, where it is expected that truth and integrity will be honored, should it not make a difference who breaks the law and what law is broken? I am inspired and energized in my efforts to abolish nuclear weapons by the witness of Jesus, Nano Nagle, and so many other prophets who challenged unjust systems and oppressive government policies. Jesus resisted the unjust laws and oppression of his day. Nano Nagle, the foundress of the Presentation Sisters, resisted the government policies in Ireland by illegally giving religious instruction in her hedge schools. Salvator Fink, a Franciscan priest, describes Nano Nagle in the following manner and I quote: “a woman whose love was stronger than viciousness, injustice, greed and violence that swamped her city and nation. She was a woman of indomitable courage, native shrewdness and indefatigable zeal for her faith. Challenging the brutal power of her people’s oppressors, she spent her life on the razor’s edge of danger.” As a member of the Presentation Sisters, I am inspired by the witness of deep faith and lived experience from this great woman. 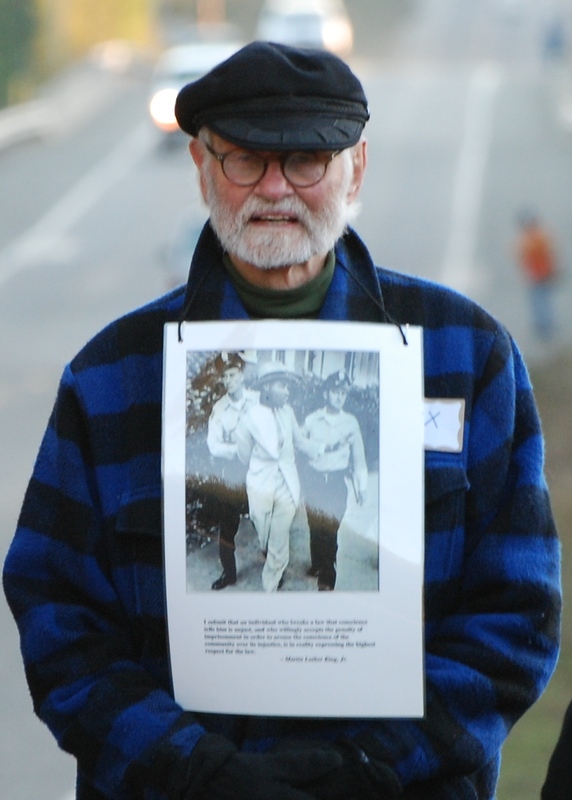 Today I face a sentence of prison for my nonviolent action resisting nuclear weapons. Like Jesus, Nano Nagle, and many prophetic witnesses before me, I accept the consequential suffering of my decision to follow my conscience. It is my prayerful hope that the nonviolent energy of each person in this room, and all people around the world, could one day soon, insure the sacred gift of life and existence for all in a nuclear-free future. We must abolish nuclear weapons! prayer at Oak Ridge Tennessee on July 5, 2010.
self commit but has not as yet been given a commitment date. I wish to thank the Oak Ridge Environmental Peace Alliance (OREPA) Community of Eastern Tennessee which is committed to peacemaking for their warm welcome. Especially do I wish to thank Erik and Libby Johnson for their embracing hospitality and the gracious sharing of their home; they are what peacemaking is about. service at The Church of the Savior of the United Church of Christ. more or less good intentions. infected our body politic and culture. continue on the walk of death we are on now. death and a shattered world. resist what brings death to all people and our creation. faithful partner of Jackie, to continue the work of Jackie Hudson. 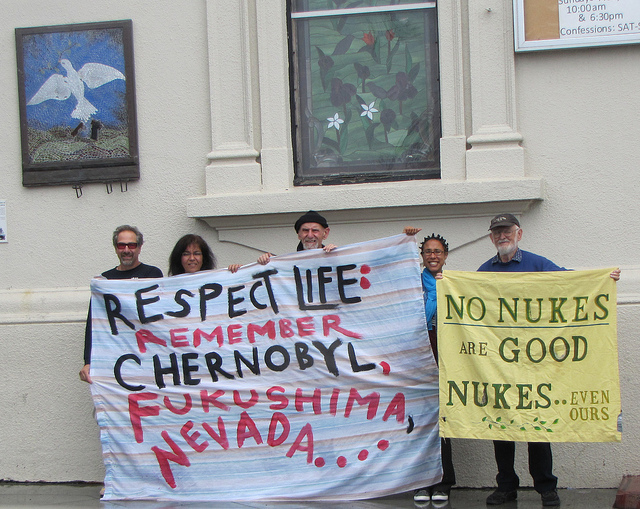 "wanted a couple photos with anti-nuclear signs outside its walls. Well, the guards insisted that cameras and prisons don't mix, hence the poorly framed, not quite set up well photos." After fleeing the prison, we took this image outside St. Elizabeth's in Oakland to show what our intent was to look like.